As we near the halfway point of the Birthright mini-series, one of the most enjoyable aspects of the journey thus far has been seeing familiar characters and elements portrayed from a fresh vantage point, giving them a new sense of vigor, clarity and relevance. While previous issues have featured invigorating new visions of Krypton, the Kents, The Daily Planet and the emergence of the Superman identity, "Menace to Metropolis!" continues the trend by introducing intriguing new aspects to the classic conflict between Superman and archenemy Lex Luthor. In decades past, the conflict between Superman and Luthor was characterized not only as good vs. evil, but also as the mano a mano struggle of near-omnipotent physical power vs. human will and intellect. At one point along the way, Luthor was even retrofitted into the childhood of Superman as a personal friend, making the eventual conflict between the two that much more emotionally charged. However, following the 1986 reboot, the Superman-Luthor conflict lost much of its former resonance due not only to the dramatic de-emphasizing of Luthor’s intellect, but also to the elimination of Luthor’s personal connection to Superman’s past. Luthor was transformed into a corrupt corporate kingpin, apparently the most potent form of evil in 1980’s America, who grew to hate Superman because he didn’t like being perceived as being Second Best. In stark contrast to the sprawling, visceral physical battles that formerly characterized the Superman-Luthor clashes, the post-reboot animosity between the two men has had a subdued, almost claustrophobic quality. Dangerous schemes and super-weapons have been replaced by a palpable feeling of stalemate, best characterized by Superman’s frequent and impotent stare-downs with a Luthor who hides behind corporate and political facades rather than directly marshaling his (once) vast intellect. This, I believe, was the challenge set before Mark Waid: How do you restore elements of the old-style Superman-Luthor conflict without removing him from the pre-ordained businessman trappings? How do you bring emotional resonance back to an emotionally inert conflict? Thankfully, the success of the Smallville TV series and its "Luthor in Smallville" premise provided Waid with the perfect opening to "re-retrofit" Luthor into Superman’s pre-Metropolis past. While the familiar "Ticked Off Superman Pays a Visit to LexCorp" scenario begins to present itself (with the spectacular "beam tracking" sequence on page 8), Mark Waid twists the familiar by introducing a number of intriguing new elements that instantly distinguish this office visit from the others. The first element is Superman’s abrupt, no-nonsense demeanor. From his startling order to "Shut up!" to his willingness to blast a hole through the wall of Luthor’s office, Birthright’s Superman seems less willing to play the verbal chess matches we’ve grown accustomed to over the last seventeen years. Though I’ve never been a fan of the "Terminator Superman" (with the glowing pinpoints of heat vision), it’s use was subtle enough not to overwhelm Superman’s measured authority (as it typically does). The second element is the restoration of a "shared history" between the two men, however brief it ultimately turns out to be. Superman’s anger and disappointment over Luthor’s corruption adds so much more dramatic power to the confrontation, far beyond the aforementioned "office confrontations" of years past, when Luthor was simply a mean guy that Superman opposed once he arrived in Metropolis. 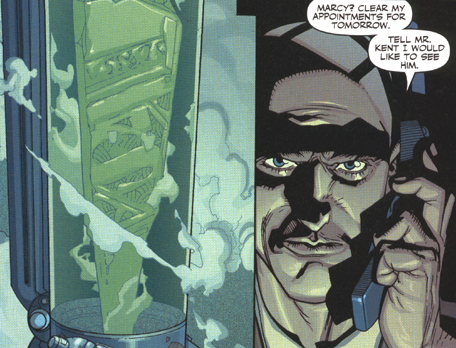 The third and most unexpected element is Luthor’s shock of recognition when he saw Superman’s "S" symbol and the subsequent mystery of its appearance etched upon the (presumably) Kryptonian artifact. These elements, combined with the implication that Luthor did indeed recognize Superman as Clark Kent, bring an exciting new level of drama to the Superman-Luthor conflict... something that, in my opinion, has been missing for some time. In the midst of these larger themes, I also appreciated the smaller details that have helped contribute to the appeal of Birthright, such as conscious decision to downplay the presence of other superheroes in the present or past. Allowing Superman to exist within his own self-contained reality, unencumbered by DC’s complex continuity, has restored an element of wonder to the familiar origin story. Superman is presented as an astonishing spectacle instead of just another in a long line of superhuman beings people have been aware of since World War II. The artwork of Leinil Yu remains exciting and fresh, though this time around I felt he occasionally strayed into self-parody, which can easily happen with unconventional stylists like Yu. 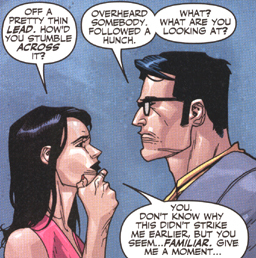 His rendition of Lois Lane looked especially distorted and, at times, quite gawky and even, dare I say, ugly. Small gaffs like Superman’s magically self-repairing costume (ripped on page 3, but just fine a few panels later) were also a bit distracting. Some of the background characters also slid into parody mode, but for the most part Yu delivered another solid effort, especially his depiction of Superman. Yu’s Superman has a hardness, a gravitas, that I haven’t seen since Alex Ross’s Superman from Kingdom Come. Gerry Alanguilan’s inking and Dave McCaig’s colors were once again solid, though McCaig might need to pull back on the "hotspot" highlights he applies to the skin of characters, which gives them too much of a "plastic" appearance. The cover was well done, especially the prominent Luthor mug, though Superman’s coloring could have been a bit brighter. Minor quibbles aside, "Menace to Metropolis" upholds the spirit of innovation that has characterized the Birthright series, as the classic conflict between Superman and Lex Luthor is given an intriguing new foundation to build upon.